Brooke was born in Afghanistan and was found with her mom and sister, Cookie, when she was just a month old. They were all brought to a rescue, but Brooke was the only one who survived. Brooke came to the U.S. a year ago, and started out in foster care in Virginia. She then made her way to a wonderful family in CT. 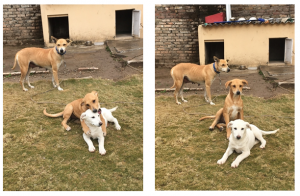 They loved her, but their Border Collie did not, so she joined us at the Sanctuary in April 2018. 2-year-old Brooke has flourished during her time here, and continues to grow. She can run like the wind, leap small buildings, is super smart, and loves her people! She loves jump up and give people her famous Brooke hug (we’re working on convincing her that people are much happier to greet her when she has all 4 paws on the floor.) She’s doing well in her training, and recently graduated our Family Companions 2 class! Brooke tends to get bored and distracted easily, so needs a family who has time to give her plenty of attention, enrichment, and exercise. 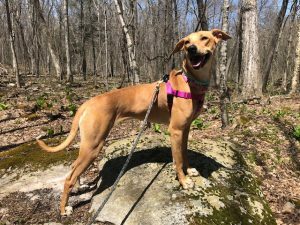 Brooke is looking for some dog-savvy, active adults who will keep her occupied with plenty of walks and hikes, and a home with a fenced-in yard so she can stretch those long legs of hers and run like the wind! This beautiful Sighthound can by shy upon initial meeting, but once you’ve gained her trust, she’ll become your loyal and steadfast companion. Once she’s tired out, Brooke will gladly hang out and watch your favorite shows with you before bed. She only requests that there are no dogs, cats, or small children in her new home. Brooke is crate-trained and about 60 pounds. If interested in meeting this sweet and perceptive gal, please contact 860-242-9999 ext. 302 or Daryl@OurCompanions.org.